If you write about the Tudors, there are two people at whom you want a crack – well, if you’re interested in women’s history, anyway. One is Elizabeth I. (Been there, done that, in several books already.) 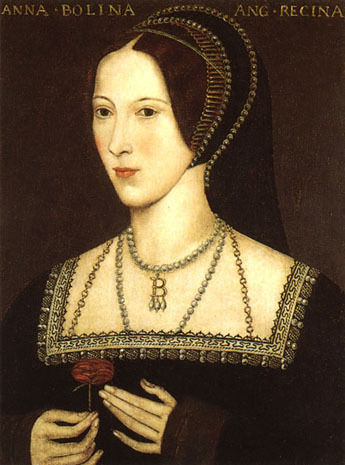 The other is Anne Boleyn, and it was only when researching my latest book Game of Queens: The Women Who Made Sixteenth-Century Europe that I saw what was really happening in that story. The exact nature of the relationship of Henry VIII and Anne Boleyn – a mating dance between dynastic necessity, Henry’s affections, Anne’s ambition and the impact of the new religion – remains one of the most debated topics in history. But besides the personal and what you might call the progenitorial – Henry’s desire for a son to inherit – there was a political element to this love story. The Anne Boleyn who returned to England after a decade in France had so thoroughly take that country to her heart as to seem – said the diplomat Lancelot de Carles – ‘a native-born Frenchwoman’. Anne’s French background played a part in her rise -meant she could play the role almost of a French princess, when an alliance with France seemed useful. But it would in turn play a part in her fall, maybe. Anne Boleyn spent her formative teenage years on continental Europe, and the lessons she learnt there would change the course of history. When, late in 1514, Henry VIII’s younger sister Mary travelled to the French court to marry the old King Louis, Anne was one of the English ladies who came to join her, remaining long after Mary had danced her elderly husband into his grave and herself returned to her own country. Claude, wife to the new king Francois I, was an uncharismatic figure – but for all of that, Anne was now living in the sphere of some extraordinary ladies. Envoys were told that Francois’s mother, Louise of Savoy, ‘lays claim to managing everything’. Anne would have observed a woman exercising power, and skillfully. Louise’s daughter Marguerite ‘of Navarre’ had also huge influence at her brother’s court – and perhaps on the young Anne. Cultivated, complex, the author of a number of published works, Marguerite was also a leader among the number of noble ladies seeking to reform the Catholic church from within. Anne Boleyn would come to be identified with what we call the Reformation, a movement actually to reject papal authority – but it may well have been in France that the germs of her evangelical education lay. Anne may, moreover, have got also an emotional education at the French court. Marguerite of Navarre’s writings harp obsessively on the themes of women betrayed by men, and of sexual violence. It is possible she had herself suffered at the hands of one of her brother’s gallants, a man called Bonnivet. That love was dangerous, that men could not be trusted, was a lesson Anne carried with her when she returned to England in the early 1520s. When Anne arrived at the English court it was the novelty of her Frenchified ways that made her both a star and a quarry for the male courtiers and the man who led them. Henry’s attempt to make her (in several different senses) his mistress can be set within a European context: the long fantasy of courtly love, the game played out in pageants and poetry. But the pattern of European events provided also a political context. There was widespread concern at Charles V’s increasing dominance of the European scene – a turning away from an alliance with Katherine of Aragon’s Habsburg family. By 1530 the imperial ambassador Chapuys could write that it was Anne’s influence on Henry VIII ‘on which alone depend the credit and favour the French now enjoy at this court’. When Anne accompanied Henry to Calais in 1532 there were even rumours the couple would marry there, with King Francois part of the company. Anne hoped that in Calais she could once again see Marguerite of Navarre ‘with whom to have conference, for more causes than were meet to be expressed, her grace is most desirous.’ Marguerite did not show up at the meeting, but as queen Anne would not forget her hope. She sent word to Marguerite herself that ‘her greatest wish, next to having a son, was to see you again’. Perhaps by then she felt the need of support, advice, reinforcement from the woman she had admired in her youth. Because the French connections which had once lent plain ‘Anne Bullen’ a borrowed importance might prove in time a liability. Of course it is true that Anne Boleyn failed – as contemporaries saw it – to give Henry a son. That the qualities which had fascinated Henry in the lover annoyed him in the wife, that Anne fell out with her erstwhile ally Cromwell over the sweeping progress of religious reform. But there was yet something else happening, maybe, Katherine of Aragon’s stock in England had always gone up and down with the desirability or otherwise of an alliance with the Spanish Habsburgs she represented. For much of Henry and Anne’s brief marriage, the discarded figure of Katherine made a Habsburg alliance impossible, for how could Henry ally with the emperor Charles V while continuing to repudiate the emperor’s aunt? But when an alliance with the Habsburgs seemed once more a goal – and when, in the early weeks of 1536, Katherine died – it was the Francophile Anne who now stood in the way. And Anne, unlike Katherine, had at the end of the day no powerful European family to protect her from her enemies. The title of my book, Game of Queens, owes something to a certain tv series, naturally! But also, it was in this era that the queen in the game of chess took on the wide powers we know today. 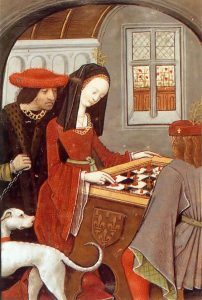 The rules of the new-style game of chess – ‘mad queen’s chess’ as it was known, tellingly – offered women another possibility. A humble pawn who won through to the enemy’s back row won the right to move with a queen’s freedom, to exercise a queen’s powers . . . While the game lasted, anyway. Because although the sixteenth century saw an explosion of female rule, for the most part women exercised power only conditionally. They would find that, all too easily, it could be snatched away. Anne’s links with France had helped her, the pawn, win a queenly role. But she would find there was a terrible price to pay.